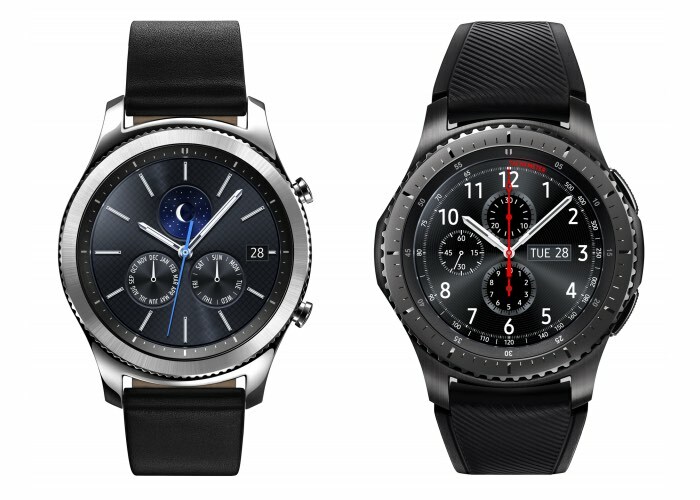 Samsung has today unveiled the third generation of its Gear S smartwatch which now aptly takes the form of the Gear S3 and will be available in two versions the Gear S3 Frontier and the Gear S3 Classic. The difference between the two is minimal and apart from a few grams in weight, a leather and rubberised strap, together with a few cosmetic differences, both models measure the same size and have the same specifications. Internally the two smartwatches are identical and are equipped with a 1.3 inch touchscreen offering a 360 x 360 pixel resolution, together with a rotational dial control and Tizen operating system similar to that of the second generation smartwatches Samsung created. Samsung has also created a range of new watch faces for their latest smartwatch which even included a second-hand which can be displayed with the new always on display option. Other features include gyro, accelerometer, barometer, GPS and optical heart-rate sensors that can be connected to the S Health app full fitness tracking via your smartphone. Unfortunately no information on pricing or worldwide availability has been released as yet by Samsung for the new Gear S3 smartwatch, but as soon as more information comes to light we will keep you updated as always.